TBS Bandar Penawar Non Stop direct service to TBS. *USB Power Point and Wifi available in standard coach fleet. Term and condition apply Terminal Bersepadu Selatan. TBS Counter A/D/E/F/G/H Terminal Bas dan Teksi Bandar Penawar. Bus from Kuala Lumpur to Bandar Penawar is the most convenient mode of transport for working adults in Bandar Penawar. 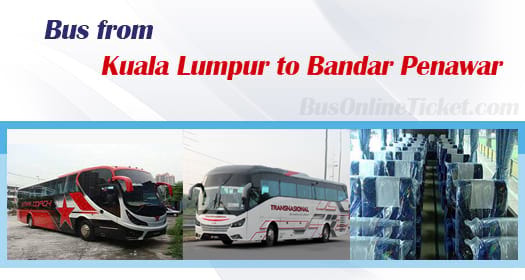 Bus is the only option to travel from Kuala Lumpur to Bandar Penawar because there is no train and flight service available between the two places. Transnasional and Star Coach Express are the only two bus operators providing bus service from Kuala Lumpur to Bandar Penawar. Transnasional offers up to 3 daily departures while Star Coach Express offers up to 4 daily departures from Kuala Lumpur to Bandar Penawar. By having this direct express bus service, passengers do not need to transfer bus from Johor Bahru or Kota Tinggi to Bandar Penawar. The first bus goes in the morning 8:30am. The last bus leaves the terminal at night 10:00pm. In between, there are several bus services from Kuala Lumpur to Bandar Penawar. The travelling time from Kuala Lumpur to Bandar Penawar takes about 5 hours depending on the traffic and weather condition. Washroom break will be given by the bus driver along the highway. Please note that all the buses in Malaysia do not have toilet facilities on board. The bus fare from Kuala Lumpur to Bandar Penawar is at RM 38.00 and RM 50.00 depending on the selection of bus service provider. Starcoach bus fare is higher at RM 50.00 because they are operating the route with VIP coach with spacious seat. The pick-up point is located conveniently at Terminal Bersepadu Selatan (TBS), which is the biggest transportation hub in Kuala Lumpur. The drop-off point in Bandar Penawar is located at Terminal Bus Bandar Penawar. Check out the bus schedule and ticket availability at BusOnlineTicket.com and make your booking online to get instant confirmation upon payment. Passengers are advised to book their bus ticket in advance through our BusOnlineTicket.com especially during weekend or holiday season.